Starbucks mission is to inspire and nurture the human spirit – one person, one cup and one neighbourhood at a time. When you give a Starbucks Code, you’re giving more than just a gift or a token of appreciation. You’re connecting with customers and employees by providing them something that’s practical and meaningful from a widely-recognised brand. 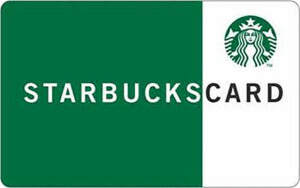 A Starbucks Code is appreciated in any amount – even smaller denominations. And it’s good for whatever they want – Starbucks beverages, pastries, whole bean coffee, coffee presses, CDs and more. The Starbucks code can also be used on the mobile app – once registered the end user has the ability to pay via the app in store, and also earn rewards.